TAMPA, Fla. (Reuters) - Florida Governor Ron DeSantis on Wednesday called for a state grand jury to investigate the 2018 school massacre in Parkland in which 17 people died, pledging accountability for any local failures that led to the deadliest U.S. high school shooting. DeSantis, a Republican elected last fall after campaigning on the issue, petitioned the Florida Supreme Court for the investigation the day before the first anniversary of the Valentine's Day massacre at Marjory Stoneman Douglas High School. He said the panel would review school safety statewide. "They are going to have the power - subpoena and otherwise - to be able to get to the facts and get the truth," DeSantis said at a news conference, flanked by the parents of slain students. 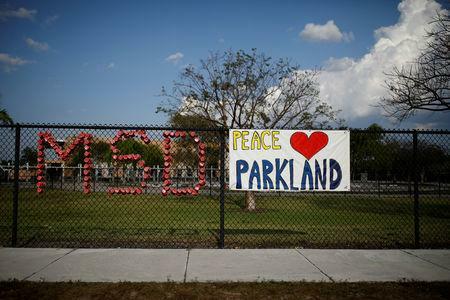 Families in the Parkland community have raised concerns about how Broward County Public Schools prepared for student safety, as well as the district's response to the shooting. "When your child is murdered in school, you expect to get some answers," said Andrew Pollack, whose daughter Meadow was killed at the school, speaking at the press conference. DeSantis said he lacked the authority to remove Broward's appointed schools superintendent. He noted that he did not find it appropriate to remove school board members who were recently re-elected after safety issues were raised during the campaigns. "I agree with Governor DeSantis for wanting to know how all school districts in Florida manage money and security issues that impact school safety," he said in a statement.